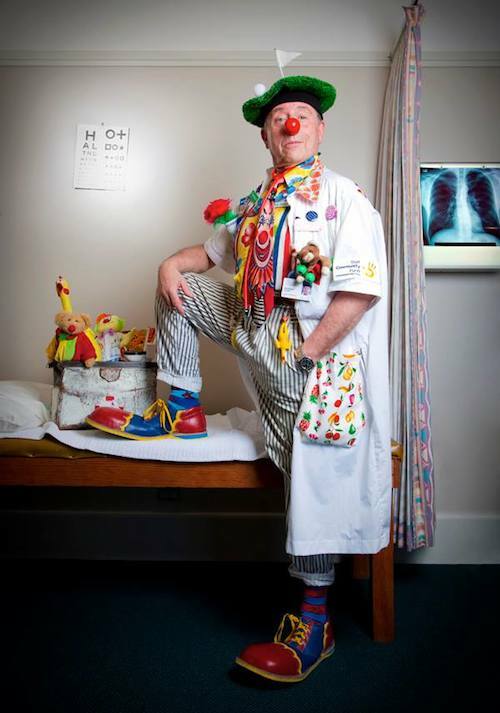 I decided today to re-blog an article written earlier this week about Australia’s very own “Clown Doctor,” Dr Peter Spitzer who I had the honour to meet and participate in a workshop run by him in Adelaide. He passed away this week due to cancer, the same week as the remarkable Robin Williams also died, who played another Smile Doctor Patch Adams . It seems, Robin Williams needed a lot more than a clown doctor, as he struggled with depression and early stages of Parkinson’s disease, as well as being a recovering alcoholic and recovering drug addict. Life can certainly be very difficult, and it never pays to pre-judge how someone is doing. Using humour for residents of aged and dementia care, and all hospital patients, not just children is therapeutic. It may not be a cure for whatever disease you are diagnosed with, but it will make you feel better for at least a little while. I often resort to the pencil trick, simply to force my ‘smile muscles’ to smile, and this never fails to help me feel more positive. Of course, that has a lot to do with the fact I am not clinically depressed, not have any other mental illness such as bipolar disorder. People living with mental illness cannot simply ‘put a smile on their dial’ and no amount of Clown Doctors will make them. But if we can, smile we must, and as often as we can, as it is good for us. RIP to three very special human beings this week: Dr Peter Spitzer, Robin Williams and Lauren Bacall. The world is worse off for without you. “Just days before the death of American actor Robin Williams, who famously portrayed doctor ‘Patch’ Adams on screen, Australia lost its very own real-life clown doctor. Max Chalmers reports. A pioneering Australian doctor who sought to use laughter as a form of medicine has passed away after succumbing to his own battle with cancer. Dr Peter Spitzer, a general practitioner who worked in Bowral, was co-founder of The Humour Foundation, an Australian charity which seeks to explore and promote the benefits of humour as part of the treatment process. The Foundation is best known for it ‘clown doctors’, who visit wards around the country bringing hope, spirit, and a sense of fun to families facing their darkest hours. In an eerie coincidence, the news of Dr Spitzer’s death comes at the same time as that of American actor Robin Williams. In 1998, Williams portrayed American doctor Hunter Doherty “Patch” Adams in the eponymous film about Adams, whose social activism and work as a clown doctor paved the way for the Humour Foundation and work of Dr Spitzer. It was a meeting with Adams that helped inspire Dr Spitzer and co to bring humour based care to Australia in the early 90s. Founding Chairman and Medical Director of the charity, Dr Spitzer also pursued related research, including a 2011 study on the impact of humour therapy in dementia care. Aside from establishing and helping to run the charity, Dr Spitzer did much of his work as ‘Dr Fruit-Loop’, a clown doctor who entertained children with magic, jokes, and no less than 30kgs of props. A post on the Clown Doctors Facebook page authored by Foundation CEO Melinda Farrell described Dr Spitzer as a “shinning star and master court jester”. “No one will be able to fill your big clown shoes. The number of red nose transplants, “cat” scans and funny bone diagnoses you have delivered over the last 17 years is countless,” Farrell said. Farrell said Dr Spitzer’s commitment to gaining the trust and respect of hospital staff and managers was what enabled the Clown Doctors to become a regular fixture in so many wards. Elizabeth Koff, Chief Executive of the Sydney Children’s Hospitals Network, said Dr Spitzer’s work would live on. “As the founder of the Humour Foundation, and as Dr Fruit-Loop, he brought joy to many thousands of children and their families. We shared his holistic approach to healing and staff will remember many jokes shared over the years,” she said. Dr Spitzer died on Friday after being diagnosed with cancer in December last year. He in survived by his two children. ← How valid are the voices of people with dementia?